Happy Wednesday friends! It’s the 25th of the month (uh, where did July go? 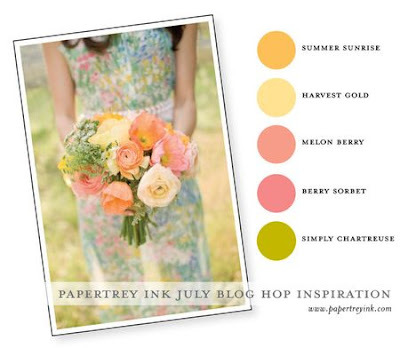 ), and that means it’s time for the Papertrey Ink Blog Hop! Is that beautiful, or what? But here’s the catch…. I literally only have one of those colours in my PTI arsenal. And at that, I only have the inkpad – no cardstock, ribbons, etc… I am still slowly collecting PTI colours, since I’ve got so much from other manufacturers! No worries, a few more of these are in my latest order, currently finding it’s way to me! It wasn’t an option for me to skip the hop – I loved the inspiration far too much to pass it up! So I did the next best thing to PTI products, and used patterned paper that followed the colour story pretty closely! Here is a close up of the embellishment on my bow… the flower was trimmed from one of the vintage laces I found in that tiny little shop in Seattle a couple of weeks ago. It’s this beautiful, 4 inch wide trim… and it’s perfect for cutting apart and using as different elements – I have another card coming your way in a day or two, and I’ll show you what I mean! Thank you so much for stopping by – enjoy the rest of your hop! So pretty! It's full of wonderful,lovely details! Love it! Hi Meredith! I LOVE your card!! Think it's fabulous! It is so soft and pretty no matter what inks and papers you had to use!! I didn't have the right inks either and my PTI floral stamps are old, but you're right…the inspiration was too pretty to pass up! I love this!! That trim was quite a find, if I didn't say it before…it's hard to find it with larger flowers like that to trim out! Such a pretty creation, my dear!! This is soooo pretty! You did great finding colors in your stash to match! Love it! This is beautiful, Meredith! I love using patterned paper on my projects! I love those papers :). Beautiful card – i love all the layering! I think you did a fabulous job pulling this off, and in 30 minutes,wow!! you pulled together a great card! Beautiful card, so soft and pretty. The flower accent is perfect. You pulled it together fabulously! so, first, i LOVE your blog title…so fun! 🙂 and your card is so soft and has such beautiful details! Beautiful card! Love the way you used the same pattern on the sentiment label as well as sentiment panel – very cool effect. And your button accent is just adorable! Meredith, you never cease to amaze me!!! I love all the layers and the soft embellishments are perfect!! How pretty. All those elements work so well together. Lovely! Beautiful layers and layout. Beautiful card, Meredith. I really like how you sandwiched the bold dots between the two soft papers.